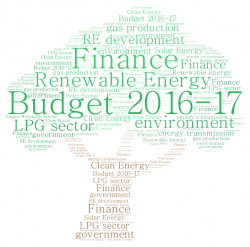 Budget 2016- has been thoughtful about the Renewable Energy sector in mixed manners. Of the nine key streams – infrastructure is one important. There shall be an outlay of a total of INR 10k crores for RE, about a half would come from NCEF*. Major chunk of this might flow towards the Solar Energy stream. However, there has been emphasis on diversifying power sources and thrust is also going to be on nuclear energy. The good news among all is the good intention of the government to electrify 100% villages in the country by 2018. That is definitely much a positive attraction for the investors in the energy transmission segment quite obviously. The Finance Minister was verbose on streamlining the administrative set ups and especially the dispute redressal which is proposed to be in the form of a Bill being introduced for institutional arrangements for resolution of disputes. It is true that this has been but a handicap in smoother development. The thrust would be on synthesizing legal framework for resolution of the PPP projects related disputes and curbing litigation. Favourable environment thus would appear in this way which is quite encouraging. There has also been a major decision like the cess on coal, lignite and peat being just doubled - it being 400 INR per ton as against the previous – INR 200 per tonne. This would be named Clean Energy Cess. This is generally anticipated that there might be a rise in tariff due to this by about 10-15 paise/unit and this might also accelerate competitiveness in the RE sector. Also, the accelerated depreciation benefit has been halved – to be 40% now [vis a vis 80%] for RE ventures – and it would have its own effects. Among other decisions – gas production industry being incentivized and a subsidy of approx 27000 cr. INR has been stated. The gas exploration sector would get much encouragement, besides, LPG sector would continue to accelerate. The thrust on LPG connections for BPL families poses a bright future already. The drive of RE development is gearing up with its definite momentum and country waits to seeing the rapid future progress – with the budget showing new directions here or there. The industry has now got to react, plan and stride ahead.